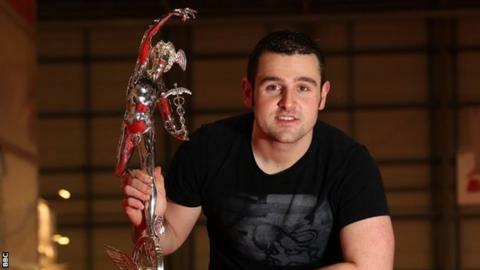 Michael Dunlop says he is "coming back to win again"
Eleven-time Isle of Man TT winner Michael Dunlop will race for the Leicestershire-based Hawk Racing team at this year's event. The racer from Northern Ireland will again ride the BMW S1000 RR Superbike on which he dominated the 2014 event, including winning the Senior TT. Last year Dunlop, 26, was hampered by injury but recorded the second fastest lap in TT history at 132.515mph. "I'm coming back to win again," said the Ballymoney rider. Dunlop's remarkable TT career began in 2007 with his first race win in the Supersport class two years later. He added: "I gave it my best last year but the Superbike crash wasn't the best preparation for the Senior. "My last lap at the TT reminded everyone what I can do and with these boys behind me I'm ready to race properly again." Dunlop will also race for the team at the North West 200 and Ulster Grand Prix, as well as campaigning the team's Superbike in a number of BSB rounds. Hawk Racing Team Manager Steve Hicken said: "We're delighted to have Michael back on board for 2016. "We know what we have to do to get him back on the top step on the Isle of Man and, with a proper lead time to prepare this year, we're looking forward to helping Michael achieve his ambitions."